Eliza and her family are doing their best to adjust to having two of their number away from home and fighting in the war in Europe. First Hugo and now Jack are gone. Like so many other Canadian families in Uxbridge, Eliza’s family follow the events in Europe closely, always hoping that they will not receive a telegram bearing bad news about their loved ones. The atmosphere in Uxbridge is certainly different since the war began. Eliza notices that her father’s words about the need for peace and understanding are not welcome in the church every Sunday, and then she gets to meet the brother of a neighbor who comes home with an acute case of shell shock. Eliza finds that she has great pity for the young man who rants, raves, cries, and is clearly very disturbed and unhappy. Eliza is sure that terrible things must be happening on the fields of Flanders, things no one is talking about. Eliza finally gets a real feel for what is happening when her own beloved brother Hugo is killed in action. Then Jack is injured and it seems as if her whole world is collapsing around her. So many of the old rules seem to be forgotten all of a sudden and as she watches her elder sister grow up into a young woman, and as she discovers that she too is changing, Eliza wonders if her world will ever be the safe place it used to be. 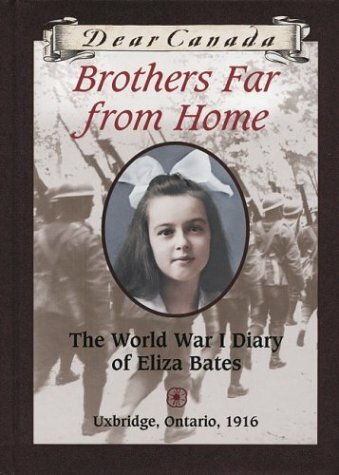 This is a truly remarkable account of what it must have been like to live on the home front in Canada during World War I. The world had never encountered a conflict of this kind before and many terrible and costly mistakes were made as generals tried to fight this new war in the old style. The numbers of soldiers that were killed and injured were enormous and many came home completely changed and often horribly damaged in their minds and hearts. Eliza’s struggles to come to terms with what is going on around her are touching and inspiring. Readers will find themselves alternately laughing at her girlish woes and enthusiasms, and grimly reading her descriptions of war news.